GLOW Canada is an outreach initiative that stands for Giving Light to Our World. You may have seen it featured on the Hope Channel. The focus of these incredible little tracts is to bring hope and wholeness to the thousands who need it. GLOW Canada is a division of Lifestyle Canada Education Service (LCES). The emphasis and purpose of the ministry is always the wholeness of body, mind and spirit of all people, regardless of religion or creed. We praise God for the positive results we are already receiving from people across Canada. It has been exciting to hear how GLOW has impacted their personal walk with God and how God has used GLOW to reach people who are searching for Him. 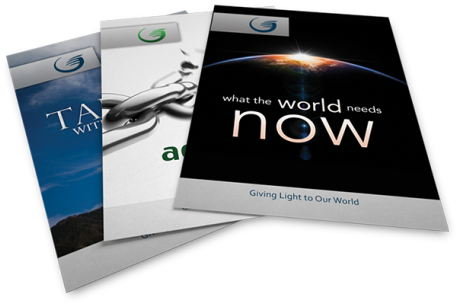 The tracts are available in English and French. In keeping up with the times, GLOW has a QR code on the back, which works with smartphones to connect to online videos for topics handled in the tracts. Contact us for your free booklet - a short manual to help you get started in this new outreach initiative.